The Harada Method is a method for personal development and is a fundament for reaching your personal and/or professional goals or dreams. Besides a method, it is also a philosophy with a warm heart. Connection with the other, with the environment, is a basic element, which also contributes to a better, more meaningful world. Did you know that the percentage of motivated employees in Italy is only 14% (Gallup study)? If you calculate that the difference in efficiency between a motivated and an unmotivated employee is 45%, it does not need much explaining that companies also show a lot of interest in this method. Organizations that find the wellbeing of their employees important, that will (continue) to invest in the personal development and motivation of their employees see it as a win-win situation, that quickly becomes visible in the company results. The method is therefore about personal development and hands you a concrete roadmap for realizing any personal, team or company goal. During this 2-day “hands-on” training, many personal and group cases will be shown with the aim of smoothing the way to your own success. It is also the only method that shows HOW to realize any dream or goal, and at the same time watch over balance. Since happy employees perform better, everybody fares well. 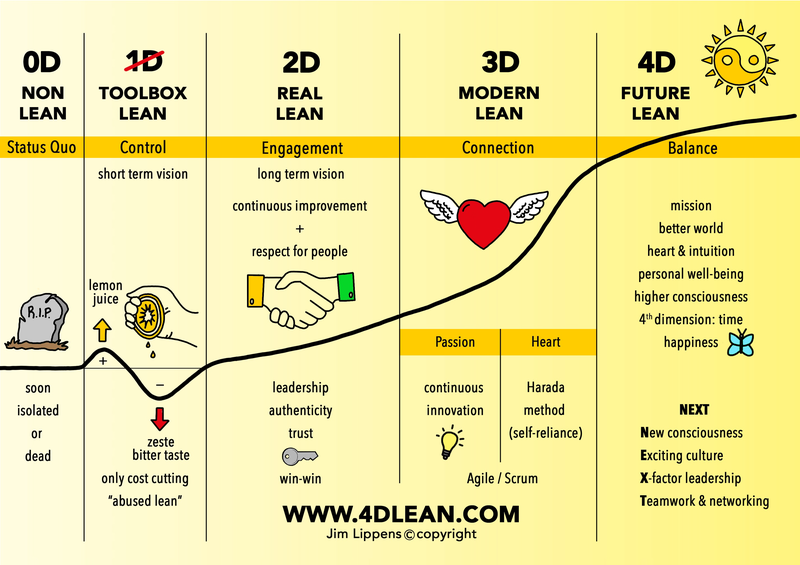 That is why the method is also called “the human side of Lean”, although the method is also perfectly applicable without the Lean framework. Smart coaches and organizations with a progressive HR department consciously choose “the method of exponential progress and involvement”. By the way, it is also the proactive move against bore-outs or burn-outs. There aren’t pre-requirements for partecipating at this training, anyone can do it!! expert in the Harada Method. so enthusiastic that he asked Jim to spread the word worldwide. Jim is a famous keynote speaker and also the inventor of the “4D Lean” model. The Harada method finds itself in the “heart” of the model. act soon to secure your seat. The ticket is individual and non-refundable, but it can be transferred to another person upon prompt notification to the organizers (if the ticket was bought taking advantage of the “Early Bird ABD Attendee” offer, the new person has to be a conference attendee as well). The class requires a minimum number of attendees to take place and to be effective to the participants. We will give prompt notification to those who registered as soon as we reach the minimum attendance. The sooner you register to the class, the sooner we’ll be able to send out the confirmation to you and to the other attendees. If we cannot reach the minimum number of attendees or if we are unable to run the class for any other reason, we reserve the right to cancel or reschedule the class. In that case, we will notify the cancellation or rescheduling to those who registered with at least a 15 days notice on the scheduled class date. In the event of a class cancellation or rescheduling, registered attendees will receive a 100% refund of the registration fee. No other indemnification is due for any other cost suffered by the attendee (including, for instance, travel and lodging expenses). Venice is a very popular tourist destination and there is no shortage of lodging solutions, from small B&Bs to luxury hotels, so you shouldn’t have any problem finding your accommodation of choice. However, please note that in high season availability can be limited and prices can be higher than usual, so we recommend that you book your room well in advance. As an alternative to the Venice island, you might want to stay at one of hotels near the Venezia Mestre train station. Trains from Mestre to Venezia Santa Lucia, especially in the morning, are frequent and the train ride is about 10 minutes. From Venezia Santa Lucia, the workshop location is at a 5-10 minute walk.